SS bead with your dogs name. 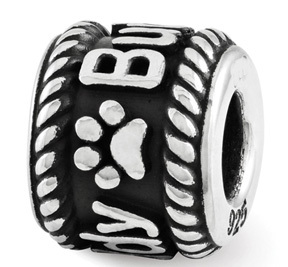 Our beads feature a rope border w/an adorable paw print w/a name up to 16 letters long. Only available in sterling silver. For names up to eight letters the name will appear on the bead twice. For names with nine to sixteen letters the name will only appear once. Names are limited to sixteen letters. Each bead is made upon request & will take up to 3 weeks for delivery.